Up until now, it would appear as though Kim Ki-duk’s films could easily be placed into one of two different categories – one for his extreme features and the other for his sensitive works. His 2005 film, The Bow most certainly fits into the latter alongside some of his best critical successes such as Spring, Summer, Autumn, Winter… and Spring (2003) and 3-Iron (2004) as it too is a contemplative piece that retains much of Kim’s signature brand of wistfulness. Never one to shy away from tough subject matter, The Bow, when compared to a lot of his recent films, is a lot tamer both in terms of violence and sexual imagery. Given Kim’s track record for provoking audiences with his patented obsession with faith and morality, The Bow, while clearly peppered with religious iconography, doesn’t seem to be all that interested in using its themes as a means to frame a story. Instead, The Bow is, for the most part, a coming-of-age drama, one that tells the sexual awakening of a young girl and features aspects of teenage rebellion – a mutual ground for most coming-of-age dramas. Of course, being that this is a Kim Ki-duk film, this coming-of-age drama is skewed towards extremely artistic territory. In The Bow, Kim takes us out onto the ocean, isolating the audience and the film’s characters by confining them to a largely unescapable setting. 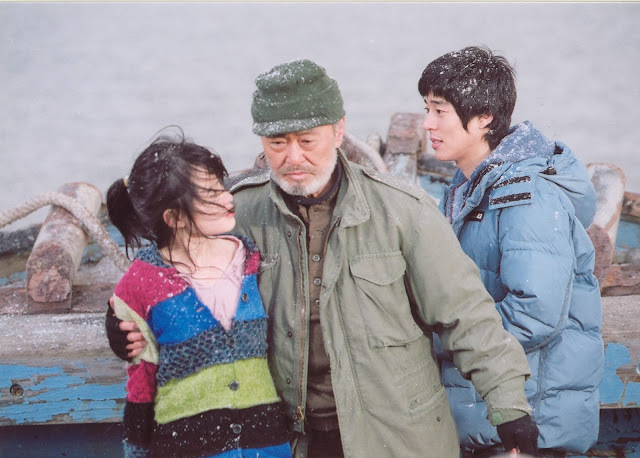 The two main characters, an old man and a teenage girl, live on a boat far out onto the ocean where land is nowhere to be seen. It’s learned that the old man had “found” the girl when she was an infant and has since taken care of her, grooming her into his future bride. Both are frequently visited by fishermen who make advances on the young girl but their efforts are warded off by the old man who threateningly shoots arrows at them. These same fishermen would also go to the old man and ask to have their fortunes told – the process of which involves the young girl swinging back and forth in front of a Buddhist painting on the side of the boat while the old man shoots arrows at her. One day, a fishing crew with a handsome student board the ship and the young girl falls in love with him upon first sight, which ultimately causes a drift between the old man and her. One of the great things to note about Kim’s films is that his characters live in a world completely cut off from reality – existing in an ethereal environment separate from the real world. Even if some of his films like 3-Iron and Pieta (2012), for example, make it obvious that the action takes place within a typical Korean town or city, the way in which Kim portrays these places feel foreign to the country, and completely in a world of its own. This can be largely attributed towards the spiritual quality that Kim endows his films with, which perhaps also explains why Kim’s films, more often than not, are considered critical conundrums. Here, the setting of a faraway boat drifting in the middle of the ocean without land in sight can be seen as a dreamy paradise. Like many of his films, The Bow is largely devoid of dialogue though unlike a lot of his past work, it is also quite soundtrack heavy. Arguably the most memorable feature of The Bow is its stirringly serene musical pieces. 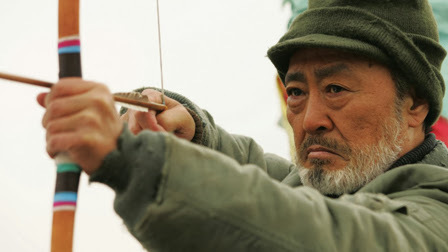 The bow that the old man uses also doubles as a musical instrument which he plays during the film (even if the music doesn’t necessarily match the movements he’s seen making) and signals a variety of emotions from longing to adoration to pity. It’s perhaps Kim’s most musically driven film and because of it, it certainly stands out amidst his body of work. Further expanding on its coming-of-age story is the presence of the old man in the film who is at once a father, a lover and a companion to the young girl - unquestionably raising her own doubts and concerns over their impending marriage. Though she and the man remain mostly mute in the film, their adoration for each other is clearly represented in their routine actions though the question remains as to whether or not these routine gestures are done out of love, affection or pity. Despite forming a sense of independency later on in the film, years of being in the old man’s presence has taught her to become co-dependent – evident in one of the most dramatic moments of the film. It might not pack as much of a punch as some of his other films but The Bow is certainly an interesting feature that nevertheless provides an interesting take on the classic coming-of-age formula. The ending of the film undoubtedly mystifies but altogether, The Bow is an introspective film of grace and another welcoming addition to the meditative cinema of Kim Ki-duk.